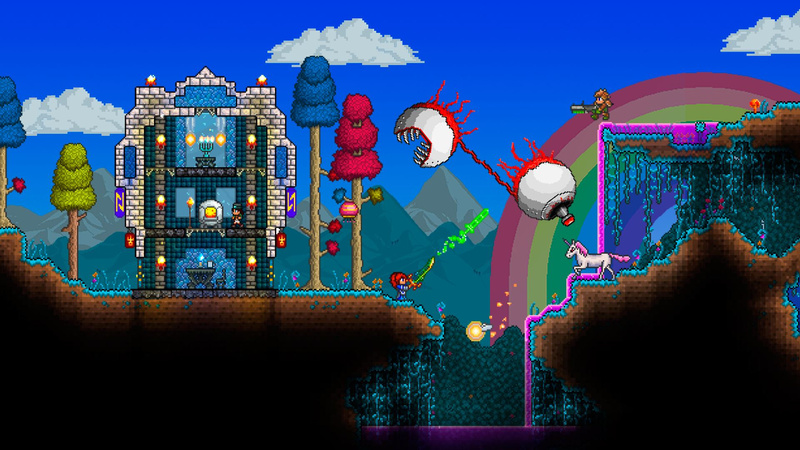 Through the course of retail listings and Australian ratings, it's no secret that Terraria appears to be heading for Nintendo hardware. Though early rumours pointed to it coming to both Wii U and 3DS, a fresh ESRB listing for North America has it down only for Wii U, with the record in question also pointing to a retail release on Vita (it's already had a PSN release on the portable). Terraria remains a solid performer in the physical retail charts, for example holding a top 40 spot in the UK for a number of weeks. The quirky 2D adventure title has a sandbox exploration nature, with level manipulation, building and crafting that has drawn comparisons to Minecraft. For those that love creative titles where strange things can happen, this certainly delivers. With multiple ratings now in, it does look like we're just waiting for 505 Games - which is the publisher of the retail versions - to make an announcement. Are you interested in playing this on Wii U? Oh no, please come to 3DS! It's like the only game I'm looking forward to right now. On the Terraria blog (or forums, not sure) they announced it was in the works for both Wii U and 3DS. Regardless of what Nintendo platform it comes out for I'm definitely getting it. Cross platform purchase a-la Mario vs DK? That'd be perfect if you ask me. I'm more excited for the 1.3 PC release tomorrow! We played the PS3 demo and I can see this doing well on Wii U and 3DS, AKA the only 2 systems on the planet w/o Minecraft. A 2 fer 1 deal and I'm sure my kids would pick it up. I wish they'd just announce it properly. I swear I read once (years ago) that they weren't bringing Terraria to 3DS because it wasn't powerful enough. But now they are? Or are they? Why is 3DS not being mentioned by the various ratings boards? Is it New 3DS exclusive? Well Terraria is getting a huge update tomorrow for the PC (1.3), so as long as that content is included, IMO it'll still be very much worth purchasing (even though other console versions released in 2013). Got this for free on Xbox. Not for me at all, but as always I'm glad for the 3rd party support (or is this indie - I really don't know) on Wii U. Every time I get into a game like this, everyone has moved on to some other game...so I'm the only one that plays it as far as I know. If they have something where I can just download this for free since I own it already on PC, then I may get it on Wii U...but yeah, game has become boring for me just like Minecraft. In light of these 3DS cancellation rumours, I took it upon myself to ask one of the devs. They're currently live streaming 1.3 on Twitch before its release tomorrow, some developers are in the chat, this is what was said. Me: Is there a 3DS version? Is the rumoured cancellation true? Now, I don't know exactly what his role is in making the game, not going to lie, but I was pointed to him in the chat when asking for the devs, and I just did a quick google and found out he's a mod on their official forums. Now I'm sure most of you don't care, but I thought I'd share with you anyway. Fingers crossed for that 3DS version guys! We're not getting Minecraft on Wii U...we're just getting something better! Wow I actually didn't think this was coming at all to the Wii U that's kinda cool. What update will it have? 1.3 is due to release tomorrow on the PC. Don't Starve rekindled my survival love in a big way, so I can't wait for this. Terraria is an amazing game. I already own the PC version ofc which is getting a huge update very soon. I will buy it if it comes out on 3DS though. 2D sandbox freedom, with charming graphics and tons of content is very appealing to me. I never played this but will get it on WiiU day one. If it keeps the online and offline multiplayer intact we have another indie highlight on WiiU. This might just be a must-have, not sure. I'd prefer it on the 3DS, I think. I'll stick to the PC version. I have this on iOS, but I'll get it on my Wii U if this is in fact happening. @joey302 it's propably too late to make that deal for WiiU and too early for NX because Nintendo propably doesn't want to show it's system specs to company owned by Microsoft.